For animals both resident and migratory, the home territory is the center of individual life. Depending on the species, a territory can be large or small-- measured in square meters or kilometers-- and holds valuable resources for foraging, breeding, and resting. How do animals make decisions about engaging in costly territorial defense, and what are the consequences of these decisions? 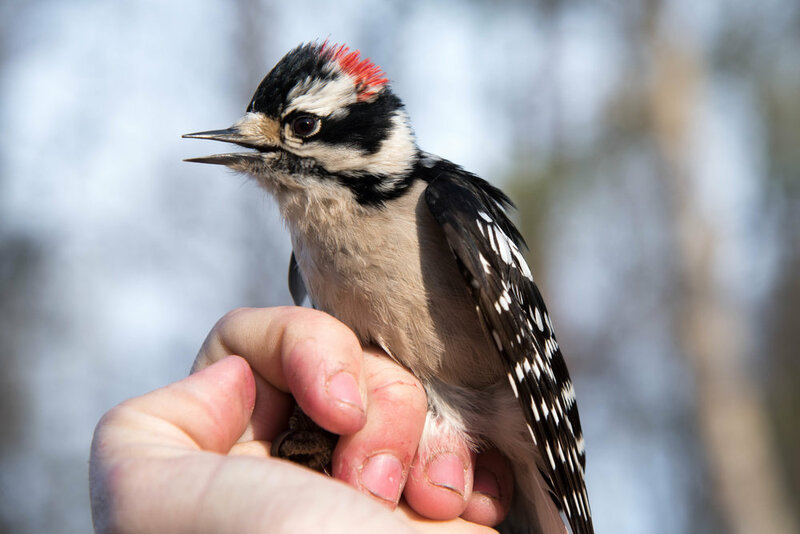 We use local woodpeckers to study patterns of territorial aggression in resident species, a group that is often overlooked in studies of aggressive behavior. 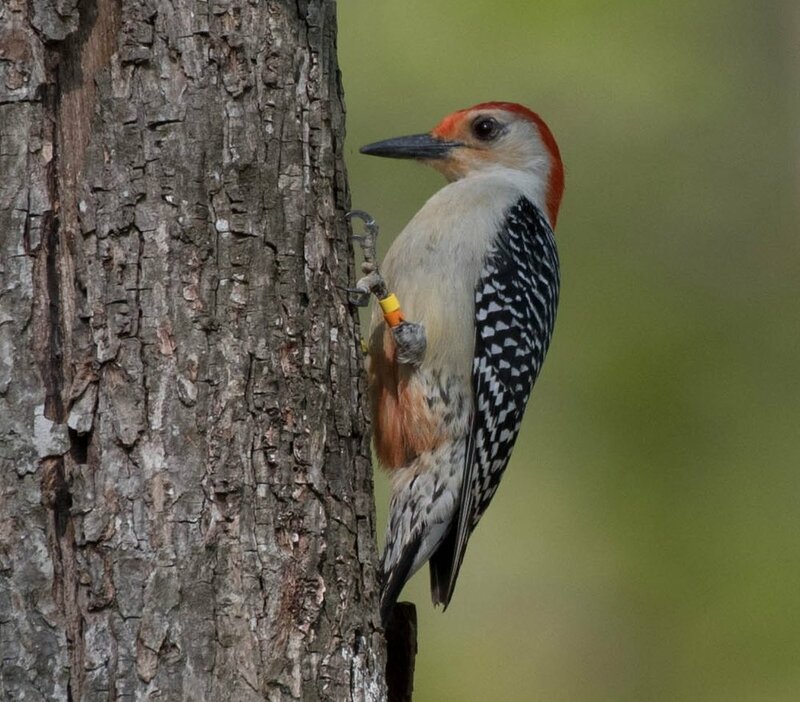 Woodpeckers are notable for the intersection of foraging, nesting, and display behavior: their primary territorial signal is a physical drumming display, which appears to be a ritualized form of foraging and nest excavation behaviors. This male downy woodpecker is part of a banded population we study right here on the Wake Forest campus. Our past work with local woodpecker species indicates that for these resident birds, territorial aggression is tightly linked with the pair bond. Downy woodpeckers (Dryobates pubescens), for example, will coordinate their aggressive behavior based on the perceived threat of an intruder. We are currently expanding our work to understand how territorial behavior affects individual fitness, and to compare territorial aggression across a variety of resident species. What mechanisms are in place to ensure that an individual deploys costly aggression in contexts where it will be most beneficial? One is the winner effect: individuals that win a territorial encounter will be more likely to win in the future, while those that lose will be more likely to lose in the future. Winner effects have been documented in a variety of animal species, but their mechanisms are poorly understood. We are working with resident bird species to better understand how winner effects form, and what their fitness consequences are. Playback experiments with local red-bellied woodpeckers help us understand how winner effects form in wild animals. Fuxjager, M.J., Montgomery, J.L.‡, Becker, E.A. and Marler, C.A. (2010). Deciding to win: interactive effects of residency, resources, and ‘boldness’ on contest outcome in white-footed mice. Animal Behaviour, 80: 921-927. Fuxjager, M.J., Forbes-Lorman, R.L., Coss, D.J., Auger, C.J., Auger, A.P. and Marler, C.A. (2010). Winning territorial disputes selectively enhances androgen sensitivity in neural pathways related to motivation and social aggression. Proceedings of the National Academy of Sciences, USA, 107: 12393-12398. Fuxjager, M.J. and Marler, C.A. (2010). How and why the winner effect forms: influences of contest environment and species differences. Behavioral Ecology, 21: 37-45.